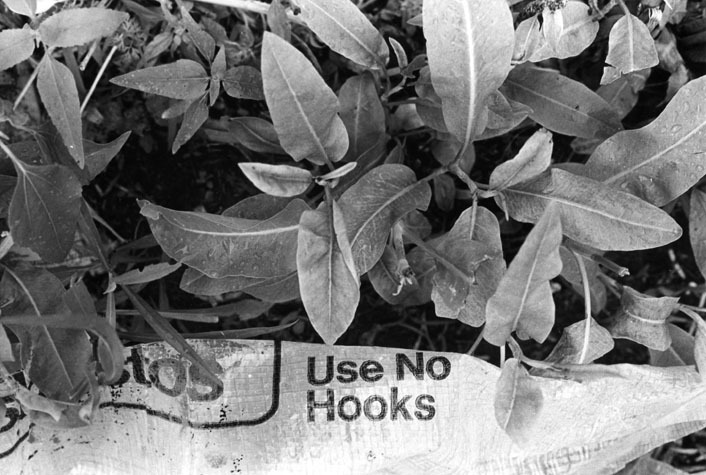 “Use No Hooks” was an imperative printed on a reinforced plastic bag used to transport asbestos. The discarded and crumpled bag was found under a flowering bush near a St. Louis landfill in 1978, and photographed on site. The photo was taken about the time asbestos was officially declared a carcinogen. The print was later shown in the Armand Hammer Health Science Library show at Columbia University, and was purchased by a friend of the artist, who was working as a paralegal for a law firm defending the Johns Mansfield Corp. against an asbestosis class action law suit. He hung it in his office. H: 14 in. x W: 20 in.